First, my husband Dan. If you have read any of my interviews, his name comes up because he is my biggest supporter and cheerleader! He was the first one who encouraged me to write and believed in me. He provides time for me to write, a computer to write on (I’ll have to write about the day he came home with a laptop to surprise me), he takes care of the kids and house when I’m on a deadline, and those times when I have wanted to give up, he has talked me out of tossing my computer out the window. I am so thankful for such a wonderful, supportive husband! My fellow authors at Enclave Publishing (formerly Marcher Lord Press). I don’t know what it’s like at other publishing houses, but here at Enclave we are a close knit group. We share ideas, encourage each other, help each other, and cheer each other on. I am so thankful to be a part of this amazing group of people. My proofreader: Julie Thiry. Thank you for seeing what I don’t see. Steven Laube. When Marcher Lord Press was bought out, I wasn’t sure where I would end up. Instead, I found another person willing to take a chance on my work. Karen Ball. Karen brought a different kind of editing to my work when she edited my third book, Heir of Hope. She is an amazing editor and helped me hone what I had already learned under Jeff. I am very thankful I was able to work with her. My readers. A writer writes because they have something to say, but they also hope to find readers who resonate with what they write. I have found that in a special group of people who are both my readers and friends. I write my heart and soul into a book and when one of my readers writes back and tells me how my story impacted them, that makes all the sweat, tears, and time worth it. I don’t know what I would do without all of you! You charge on ahead, sharing posts, reviews, and your love for my series. That is something I cannot do as the author and I thank you for sharing on my behalf. Lastly, but most importantly, God. Without Him, I would not be where I am today. I have been down some really dark roads, ones that would have led to certain destruction if God had not been at my side. Through my brokenness, God poured a story through my heart, a story that I have turned back toward God in worship. If you have been touched the words in my books, then you have been touched by my love for God. There are many more people who have helped me over the years: people from conferences, other writers, teachers, and family members, and to each I thank you. 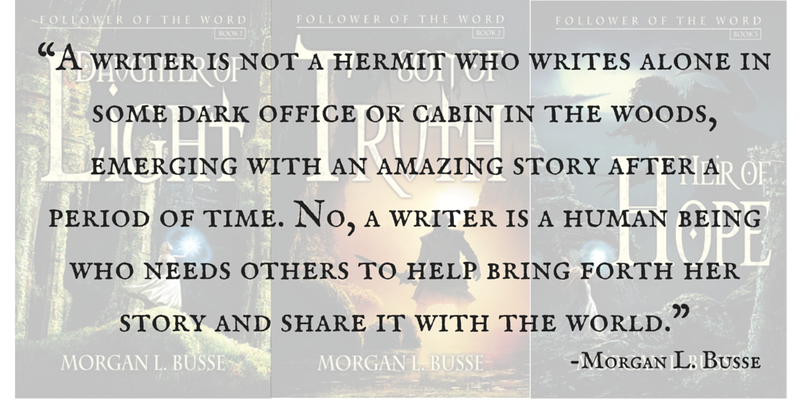 A writer is not a hermit who writes alone in some dark office or cabin in the woods, emerging with an amazing story after a period of time. No, a writer is a human being who needs others to help bring forth her story and share it with the world. And for all of you who helped me bring forth mine, thank you. I have been writing for a couple years now (make that seven this up coming spring). During those years I have wrestled with characters, plots, journeys, and climaxes. I have placed obstacles before my main character so that she can grow, become stronger, and ready to face the next set of trials I have for her. Then it hit me one day. These things I do as a writer, God does with us in real life. As the Author, God is in complete control of our lives. He knows the beginning and He knows how it’s going to end. He knows what needs to be placed in our lives to untangle that knot of sin inside of us, to make us more like His Son. He brings other people (characters) alongside of us. Some of these people help us on our journey; some of them try to hinder us. But God provides a way for us to stay on the right path. God also knows what lies ahead of us. He will even place trials in our lives to make us stronger and ready to face the next chapter. But through the whole story, the Author (our God) is with us. He isn’t just watching our story unfold; he is guiding it, moving it along. He is intimately a part of it. Nothing that happens to us takes God by surprise. I’m sure if my own characters could talk to me, they would ask me why all this stuff is happening to them. But I see the end. I know what the villains are planning, and if they were allowed to continue, would bring great suffering to the world. Therefore my characters need to be ready to step up when the time comes. As a character in God’s story, I find myself asking the same thing: why is all this happening to me? But unlike my characters, I know the Author of my life. He’s writing the entire story. He sees how my life will intersect with the lives of others and how those meetings will change us both. Each thread in the story God is weaving together for the ultimate ending. Every one of us is an important part of the story of Life. The story would be incomplete if even one of us is absent. So when the dark times come, know this: God sees how it’s all going to work out in the end. He has a plan and we are all a part of it. And when God writes The End, the story will be a masterpiece that will leave us in awe and bring Him glory.